It could be argued that there are no greater expressions of the great heights that spirits can reach than are reached by the aged French spirits of Cognac, Armagnac and Calvados. Each term refers to a specific region. 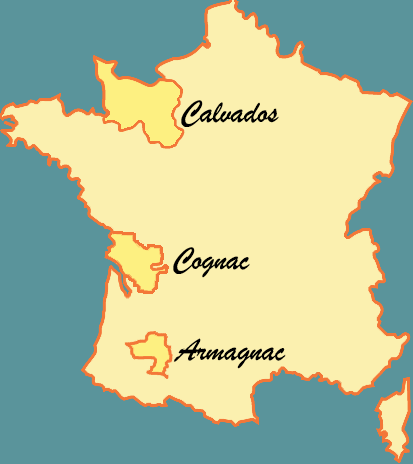 Armagnac in the south-west of France, and Cognac near Bordeaux both make aged spirits from grapes. Calvados in the North makes aged spirits from apples. What they have in common is that old versions from a good producer are unmatched in the world for their lyrical complexities, their ability to transform themselves over forty minutes in a glass, taking the drinker on a journey. It could be equated to the life of a person: when it is poured in the glass it is a teenager, full of unrefined beauty and a lust for life, like a powerful, tight ball of emotions casting its energies wildly in any direction; soon the drink blossoms into its twenties, it becomes immediately more complex, still highly energetic, but showing more of what it is capable of; some minutes later and the drink has moved into its thirties and forties and has exchanged some of its youthful exuberance for the true extent of its character; further along the drink moves into middle age, its complexity remains, but is more focused and the noise has dropped to a more conversational level; finally, as half an hour drifts toward its autumn years, the flavour is deep and syrupy, the complexity remains but it is quiet complexity, beneath the surface of molasses, old wood and spices. Spirited Tales Cognac, Armagnac and Calvados tastings can focus on one of the borader categories, on sub-regions or specific grape varietals within Cognac, Armagnac and Calvados, or cover an overview of the three. The focus in all of these tastings is to concentrate on fine spirits and therefore we taste fewer brandies but in slightly larger quantities to allow the class to experience the type of journey described above.